Everyone gets frustrated with fishing for northern pike, and bass when trying to get in the weeds where the fish really are. Here is a lure that is going to solve that frustraion. This is the ONLY truely weedless fishing lure on the market today. 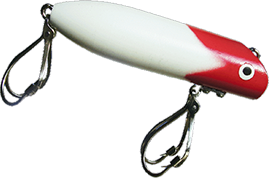 It is the "FishTrap" fishing lure. This is a spoon specially designed for the weeds. It will work just as well outside of the weed beds. You can cast, or troll right through the weeds... where the fish are. The special design hides the treble hook up in the spoon, A stainless steel band holds the hook in place. When the fish strikes the lure, the band releases and the hook slides out, with the hooks securely in the fishes mouth! The uniqueness of this lure makes fishing so much fun. It allows you to keep the lure in the water, not in the boat cleaning off the weeds. The plugs work with the same concept. The 2 individual hooks are tucked in a harnes, till the fish stikes and you set your hook. The hooks pop out of the harnes and directly in the fishes mouth. This allows you to cast into the lilly pads, rice paddy's and anywhere there are nasty weeds. These lures make it fun for kids! Dock fishing is a favorite for kids, and it allows them to actually fish, and not give up because of getting snagged in the weeds. With the wide variety of colors and 3 sizes to choose from, there is something for every true, hardy fisherman. Be sure to view our demonstration video..